Most people do not reach their full potential height due to a number of reasons that they can change. 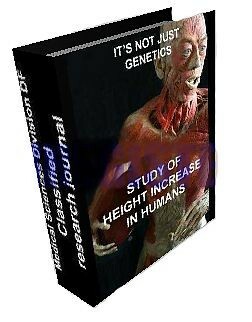 This is an award winning medical journal that advises on what you can do to ensure you have a better chance of reaching your natural potential genetic height. You are not permitted to distribute electronically or physically this product to any other person. Due to profits of this item going to the creators in which extensive work was done to obtain the information, it cannot be refunded. Based on doctors and medical professionals research between 1983 and 2010. The secrets to promote height growth and get taller naturally Ideal for anyone at any age including parents who want the best for their children. Please note it is for personal use only, not for resale or any other commercial purpose.